There are countless streets across Italy named after Ugo Bassi, including an important one in the centre of Bologna where his statue now stands. Although largely forgotten today at least by non-Italians, his fight and death was a great liberal cause célèbre. Born in Cento in Emilia in 1801 and educated in Bologna, he turned to the priesthood after a disappointment in love, and went to Rome, where he joined the Barnabites, an order dedicated to ministering to the working classes and to education. He was known for his exuberance and enthusiasm; he studied English and French as well as Latin and Greek, learned to draw and play the guitar, flute and violin. 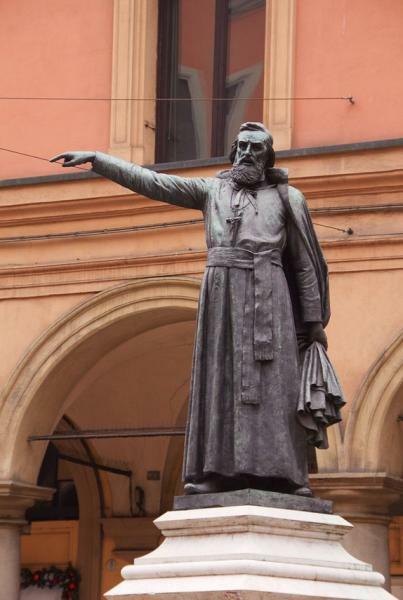 Later based in Bologna, he travelled throughout Italy, famous for his eloquent sermons and ministry to the poor, whose poverty he shared, although he often found himself in trouble with Rome. In 1846, he enthusiastically supported the new pope, Pius IX, whose pardon of political prisoners in the Papal States gave Bassi hope that the new pope was a liberal. Two years later he joined in the Risorgimento fight against the Austrians as a chaplain. He saw Pius IX's declaration of neutrality in the fight as a betrayal. Bassi's courage, aiding and ministering to the troops on the front lines in the battle of Treviso led Garibaldi to comment that he was the bravest of the brave. He was wounded three times and took refuge in Venice, which at the time was fighting the Austrians under Daniele Manin, who became a close friend. He returned to Bologna in December 1848, where he encouraged the people to fight and liberate Italy, and came out in favour of the new constitution for the Roman Republic, even though Pius IX excommunicated all who supported the end of Papal States. In April 1849 he became the chaplain to Garbialdi's Legione Italiana, and was wounded in the fight against the French, allies of the Pope, on the walls of Rome while tending to the wounded. I am guilty of no crime save that of being an Italian like yourself. I have risked my life for Italy, and your duty is to do good to those who have suffered for her. The governor replied by handing the two men over to the Austrians; they were imprisoned and a few days later, on the order of the Austrian commander, taken to Villa Spada and executed by firing squad. Bassi was buried at the Certosa.